• To create a lifetime income stream to supplement what you receive from Social Security, pension plans, and other employer-sponsored retirement plans. • To maintain financial independence. For example, you can use annuity funds to pay for long-term care expenses and stay in your own home, rather than rely on your children for care. • To invest for any specific purpose or long-term goal, such as providing a legacy for your heirs or making a charitable gift. • To receive tax-deferred earnings. • If purchasing a variable annuity to fund a qualified retirement plan or an IRA, you should do so for the variable annuity features and benefits rather than for tax deferral. In such cases, tax deferral is not an additional benefit of the variable annuity. Many variable annuities have riders that can be added for a fee. Examples include riders that allow for withdrawals for life while retaining access to principal, riders that provide for a minimum accumulation, and riders that provide for a minimum income. A variable annuity is a contract between you (the purchaser) and an insurance company (the issuer). In return for your premium payments, the issuer agrees to make periodic payments to you (if you elect this option), beginning either immediately or at some future date. Annuity premium payments may be made with after-tax dollars and are not tax deductible. Annuities also may be purchased within tax-advantaged plans, such as 401(k) plans, Section 403(b) retirement plans (TSAs), or IRAs. Premiums for annuities in tax-advantaged plans are generally paid with pretax dollars, and may be subject to annual contribution limits. You can pay your premiums in one lump sum, or you can make a series of payments over time. Annuities funded with after-tax premiums are not subject to annual contribution limits. If your annuity is funded with after-tax dollars, you’ll pay taxes (at your regular income tax rate) only on the earnings portion of withdrawals, since your contributions to principal were made with after-tax dollars. As with a qualified retirement plan, if you withdraw from an annuity before age 59½, a 10% tax penalty may be imposed on the taxable portion of the withdrawal, unless an exception applies. Annuities are designed to be very long-term investment vehicles. In most cases, if you take a withdrawal, including a lump-sum distribution of your annuity funds within the first few years after purchasing your annuity, you may be subject to surrender charges imposed by the issuer. As long as you’re sure you won’t need the money until at least age 59½, an annuity is worth considering. As the purchaser, you can designate how your premium dollars will be allocated among the investment choices (often called subaccounts) offered within the variable annuity. A variable annuity’s subaccount choices will be described in detail in the fund prospectus provided by the issuer. With the exception of a guaranteed subaccount, variable annuities don’t offer any guarantees on the performance of their subaccounts. You assume all the risk related to those investments. In return for assuming a greater amount of risk, you may experience a greater potential for growth in your earnings. However, it’s also possible that the subaccounts will perform poorly, and you may lose money, including principal. *Guarantees are subject to the claims-paying ability and financial strength of the issuer. A note about variable annuities Variable annuities are sold by prospectus. Variable annuities contain fees and charges including, but not limited to mortality and expense risk charges, sales and surrender (early withdrawal) charges, administrative fees and charges for optional benefits and riders. You should consider the investment objectives, risk, charges, and expenses carefully before investing. The prospectus, which contains this and other information about the variable annuity and the underlying investment choices, can be obtained from the insurance company issuing the variable annuity or from your financial professional. You should read the prospectus carefully before you invest. 1. In the accumulation phase, you (the annuity owner) send your premium payment(s) (all at once or over time) to the annuity issuer. 2. You may choose how to allocate your premium payment(s) among the various investments offered by the issuer. These investment choices, often called subaccounts, typically invest directly in mutual funds. Generally, you can also transfer funds among investments without paying tax on investment income and gains. 3. The issuer may collect fees to manage your annuity account. These may include an annual administration fee, underlying fund fees and expenses which include an investment advisory fee, and a mortality and expense risk charge. If you withdraw money in the early years of your annuity, you may also have to pay the issuer a surrender fee. 4. The earnings in your subaccounts grow tax deferred; you won’t be taxed on any earnings until you begin withdrawing funds or begin taking annuitization payments. 5. With the exception of a fixed account option where a guaranteed* minimum rate of interest applies, the issuer of a variable annuity generally doesn’t guarantee any return on the investments you choose. While you might experience substantial growth in your investments, your choices could also perform poorly, and you could lose money. 7. Just as you may choose how to allocate your premiums among the subaccount options available, you may also select the subaccounts from which you’ll take the funds if you decide to withdraw money from your annuity. 8. If you make a withdrawal from your annuity before you reach age 59½,you may have to pay a 10% premature distribution tax on the taxable portion of the withdrawal, unless an exception applies. 9. 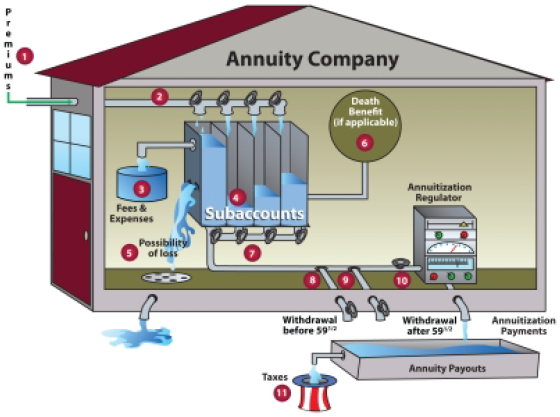 After age 59½, you may make withdrawals from your annuity proceeds without incurring any premature distribution tax. Since annuities funded with after-tax dollars have no minimum distribution requirements, you don’t have to make any withdrawals. You can let the account continue to grow tax deferred for an indefinite period, subject to limits specified in the annuity contract. 10.To obtain a guaranteed* income stream for life or for a certain number of years, you can annuitize, which means exchanging the annuity’s cash value for a series of periodic income payments. The amount of these payments will depend on a number of factors including the cash value of your account at the time of annuitization, the age(s) and gender(s) of the annuitant(s), and the payout option chosen. Usually, you can’t change the payments once you’ve begun receiving them. 11.The tax you pay on withdrawals (at your ordinary income tax rate) depends, in part, on whether the annuity is funded with pre-tax or after-tax dollars.